I planted a lot of heirloom tomato plants this year. News flash. Since I didn’t really have a plan for marketing them, having closed up our farmer’s market table this summer, I did field many questions about precisely why I was planting so many, besides the fact that it was keeping me out of the house, which is what I prefer, naturally. I was vague and noncommittal in my answers, because . . . I . . . well, just because. I didn’t have a plan for what I was going to do with all of them, Gentle Reader, I just knew that I had to grow them. Besides the old favorites that I’ve written about already, I have gardening friends who shared plants with me this spring, and so I was introduced to some new heirloom delights, which I’ve added to my ever-expanding list of heirloom must-grows. You see the conflict here, don’t you? My list of favorites keeps growing, as my garden ought to be getting smaller, not bigger! Oh well (picture me shrugging, and throwing off common sense for one more gardening year. And popping one more Sunsweet II into my mouth). I didn’t even order any new tomato seeds this year, believe it or don’t, but I still managed to plant over a hundred tomato plants (well over, *cough*) and I don’t regret a single one of them. In short, it has been easy to find homes for my superfluous tomatoes, even without much effort on my part. AND I’ve been able to eat like a homestead hog on them, all summer long. Life is good when you’ve got a steady supply of heirloom tomatoes to cook with, to can up into salsa and tomato soup, to give to friends and sell to customers. AND I still plan on making a batch or two of this salsa that ruins everything, another batch of tomato soup, and some pizza sauce. Gosh, I’d better get busy! Really, it has been so nice. Having too many tomatoes is a piquant blessing. But this post is about a few new favorites I grew this year. So without further ado, and in no particular order, here are five new favorite heirlooms that I’ll grow again. I have my gardening friend Russ to blame for this one. 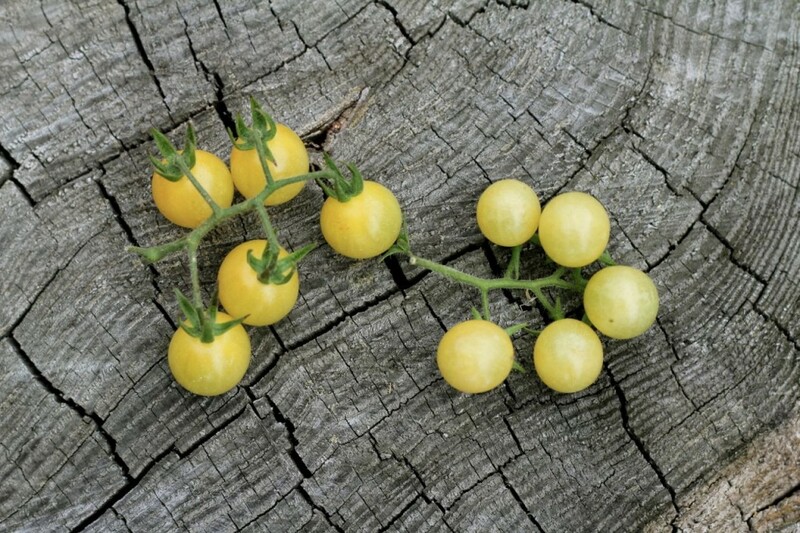 I couldn’t remember even where it came from, this lovely little pale yellow cherry tomato that I discovered in my lineup in the hoop house, so I had to do a bit of digging in my seed collection. I came up with the envelope that Russ sent me in the early spring, bragging on this lemon-colored jewel. Russ wrote “plants have imperialistic tendencies–so give them room” and I found this to be true. They perhaps are the most lush and enthusiastic plants in my hoop house, growing out of the tops of my 5′ tall tomato cages and then tumbling all the way down to puddle on the ground at my feet. That’s at least 10′ of vine, folks, if my second-grade math skills are to be trusted. The lush plants are loaded with sprays of small pale yellow berry-like tomatoes. The flavor is mild and unique. The skins are a bit thin. They do pop into the mouth (or on top of a salad) so nicely, though. The green zebra, I think, is for many people the entrance non-red-colored heirloom tomato. In fact when my friend Mr. Lawrence admitted that for his tastes, a tomato must be red to be acceptable in his garden, I asked him (after my initial gasp of disbelief and then dismay, coquettishly hidden in a delicate cough) if he had tried the green zebra. It has long been in my top ten list, as it is in many other heirloom tomato fancier’s lists. There are great reasons for this. It is a smaller, salad-sized tomato, zingy and full of flavor, and the vines are vigorous producers, to boot. It’s just a winner in a lot of growers’ books. This new close relative of the green zebra has the same qualities, only in a red and yellow striped color. I just love it. So here you go, Mr. Lawrence: a truly outstanding little striped heirloom tomato, and it’s not green! 🙂 Start with this one, and maybe in a year or two I’ll have you slicing up green striped tomatoes on your BLTs, with relish. I think my friend Gene shared this plant with me. I just adore the new blue and purple tomatoes, as you well know. They are just stunning, and of course are loaded with anthocyanins, those antioxidants that we are trying to get more of into our diets. The “Indigo Rose” tomato appeared a couple years ago, the first truly purple variety, through the program at Oregon State University that is working to breed tomatoes with higher levels of antioxidants. One year in the not-too-distant future, it won’t be startling to see this purple color in our tomato patches. But right now it is a visual delight, and a surprise. 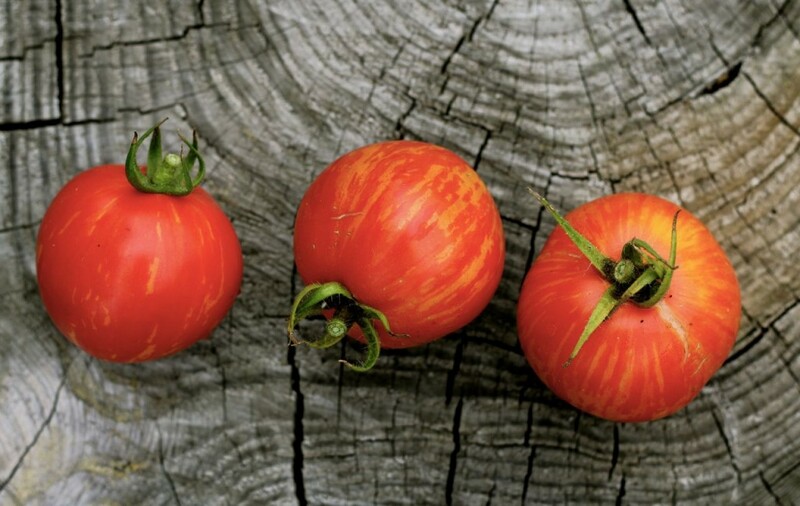 You can read all about this new tomato variety here, and also about why anthocyanins are such a big hairy deal. 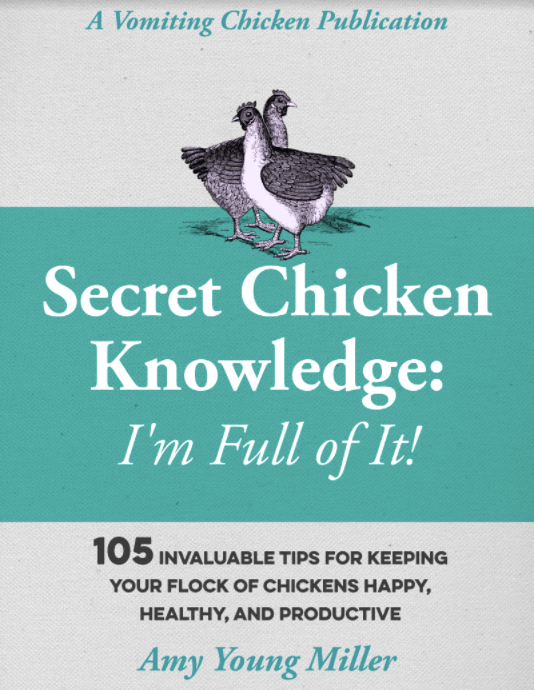 See, decent reading on vomitingchicken.com, at last! 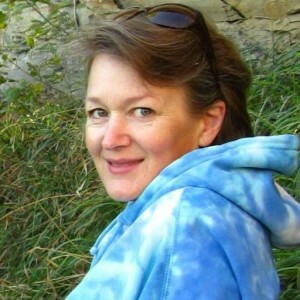 This is another prolific producer, and is visually stunning, as well. 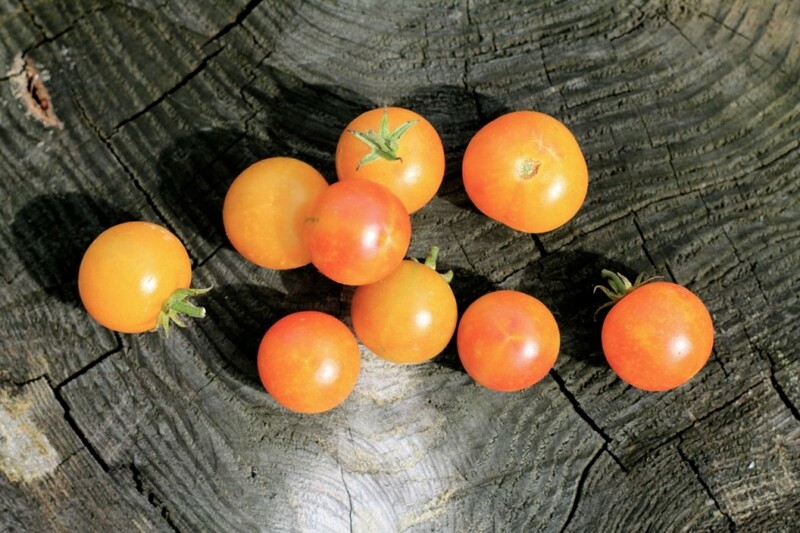 These tomatoes are a bit larger for cherry tomatoes, and come in shades of blushing yellow and red, usually with golden flesh, and sometimes are swirled in color. They are very sweet, and mine had a tendency to crack, but usually in a spiral–such a pretty cracking pattern! . . . so it is all good. Oh, and they produce like crazytown. Bushels. Upon bushels. I am just entranced by this little tomato, for so many reasons. It grows in enthusiastic clusters on a rather small plant (by my garden’s standards) and the tomatoes are sweet and tangy, and rather small, also. The nifty thing about this tomato, I guess, is that it has a slightly fuzzy skin, unlike any other tomatoes I grow. The flesh is yellow and very juicy. This heirloom was developed in Iowa, and named after the Wapsipinicon River, a great place to fish, apparently. Who doesn’t love peaches, Iowa, and fishing? Ergo. Everybody ought to grow this tomato. It only stands to reason. If it were possible to keep a tomato for a pet, I’d keep the Wapsipinicon Peach. So there you have it. 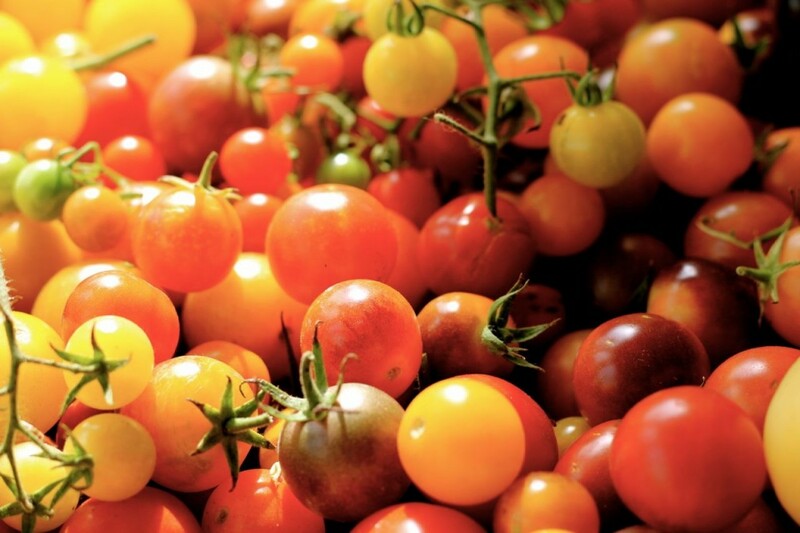 Five new heirloom tomato favorites from my garden to yours. And be assured, Gentle Reader, that if you decide to plant way more heirloom tomatoes than is prudent next spring, I’ll be the last one to laugh. I’ll nod sagely and agree that you’ve done a Very Wise Thing. As far as sources for seeds—hmm, it doesn’t help you to say my sources are “Russ, Gene, Jamie . . . ” but I think you can find most of these varieties through Baker Creek Heirloom Seeds, High Mowing Seeds, or Territorial Seeds. They are all great sources for heirloom tomato seeds. Two years ago: top heirloom varieties that I grew. Last year: My top 11 heirloom tomato varieties. Thanks again for checking in, Gentle Reader. If you have time to write a comment, PLEASE, oh please, share with me what your favorite heirloom tomato varieties are. It doesn’t matter if you grow them or buy them at farmer’s market, I’d love to hear from you! After only gardening for 2 years, I have to say my favorites for taste were the black cherry and the Cherokee Purple, but the huge Pineapple tomatoes were so beautiful to cut into with their amazing colors! Let’s do that next summer, okay? I’d love to share plants with you next summer. I always plant too many and have plenty to sell in May. I think having an heirloom tomato tasting event at our place next summer or early fall is an awesome idea! What may appear fanciful to some may be faithful to another. Bravo on a bumper crop and enjoying the bounty. Living in a house with no bare dirt, I have two varieties of tomato and a rogue Basque pepper in a pot. Thank you for sharing the info and pics of the possibilities which are out there. Some of us would even enjoy seeing the rest of the plant as I recall there can be much variety in those characteristics also. We’re going Elderberry gathering this morning. We still have them in Idaho and my husband is hooked on drying them. Thanks for getting all that started! Well done, you! I will try to get pictures of my plants this week, as I’ve had other requests, too. I really itch to pick more elderberries here, but I do have a couple of bags in my spare fridge, waiting for me to make them into tonic, so I’m going to take care of them first. Once you start on a foraging journey, it quickly becomes a passion! What beautiful heirlooms you have Amy! I’m glad I ran into your post on the Painted Teacup link share. 🙂 I have to admit I am not a fan of eating tomatoes straight up. Gasp! (delete comment, ban user, block ip address 🙂 Granted I haven’t really tried any heirlooms, but I do love all sorts of foods and sauces made from tomatoes; pico de gallo, salsa, pasta sauce etc.. having said that your post makes me want to try growing heirloom tomatoes just because they are so pretty. What would you say are some good heirlooms to try for a non tomato eater? I appreciate your honesty. Now here’s a shocker: my kids at home and my hubs don’t like fresh tomatoes straight up, either. *gasp* But they still eat lots of them in sauces, casseroles, soups, etc., so I don’t bear them grudges. Here are my suggestions for good heirlooms to grow if you want to cook with them, but not eat them fresh: pink Brandywine is an excellent tomato, and a great producer. Also, Granny Cantrell. (Those two are pink.) 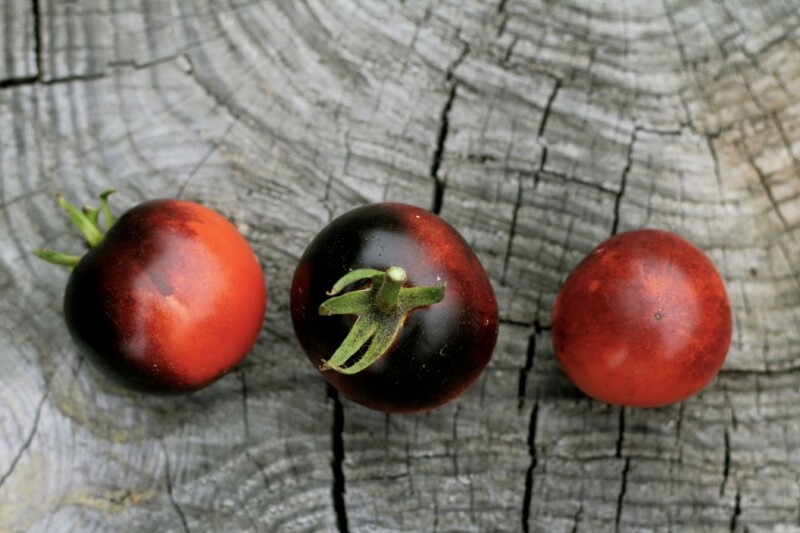 For a deep purple tomato, with that great complex rich taste, I’d go with Paul Robeson or Cherokee Purple or Black Krim. 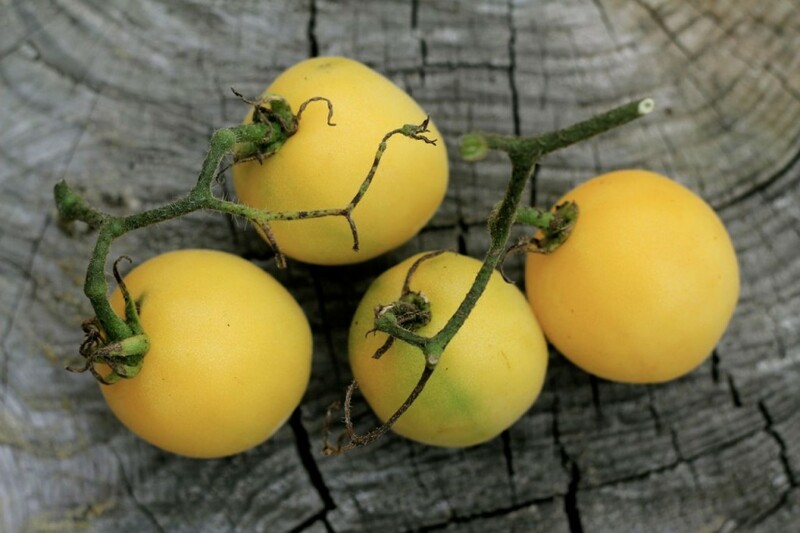 For an outstanding large yellow tomato, I’d go with Dr. Wyche’s Yellow, and if you want lots of colors for salads, I’d certainly grow a couple of Green (or Red) Zebras. You really just can’t go wrong. Also you might want a good paste tomato (I just love Cream Sausage or Striped Roman) if you want to make sauces. Good luck, and get to growing, man!